When I hear "vintage" I think of something special, cherished and a treasure from years ago. How fitting that word is for the Breyer horses of the 1950's, 60's and 70's. As a child, I loved my horses. They were my playmates during the day and my guardians as they watched over me at night. As an adult, these horses are treasured mementos of my youth. 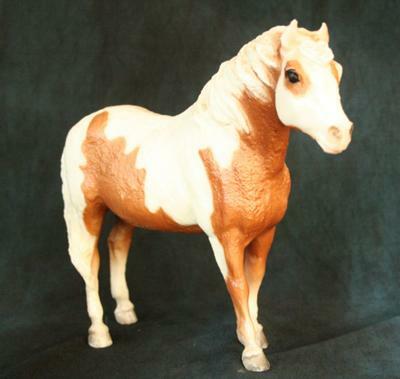 Whenever I see a Breyer from those days, it bring back fond memories. Technically I guess vintage can be attributed to something that is at least 25 years. However, I tend to think that it may depend on the beholder. With me, vintage goes back to the 50', 60's and early 70's. I suppose that was when I was a child and a Breyer horse opened up a wonderful world of fantasy. I saw that same wonderment today at my work when a young girl excitedly bought a Breyer to the register and told me all about her big herd of Breyer horses. I am sure years from now she will cherish her childhood Breyers as much as I cherish mine. So very true and what a great perspective. Model Horses really are so much more than "just toys". I think the memories of playing with your Breyer Horses and how special they were to you then, and still are today, is great. But certainly is something different about the older models a Collector simply cannot ignore.